Saturday morning, June 8th, the Feud Reignites. 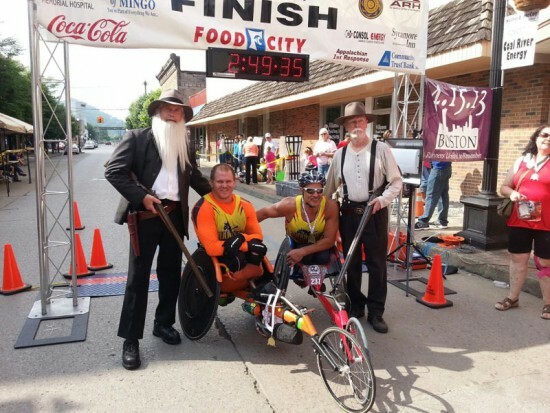 The Hatfield & McCoy Marathon begins at 7:00 am and runs through some scenic countryside in both West Virginia and Eastern Kentucky. Each participant is going to be designated as either a Hatfield or a McCoy and at the end of the race the family with the lowest total time will be the winner of the Feud for 2013. The course is going to test our athletes abilities with constant changes in elevation. It is after all the Appalachian Mountains. The weather at the start is supposed to be 63 degrees with a calm breeze, but also 90% Humidity. Hopefully it will rain a little bit to keep everyone cooled off. Having frequent elevation changes and high humidity is likely to get the runners and wheelers overheated. Good thing there will be 25 Water Stops approximately every mile. 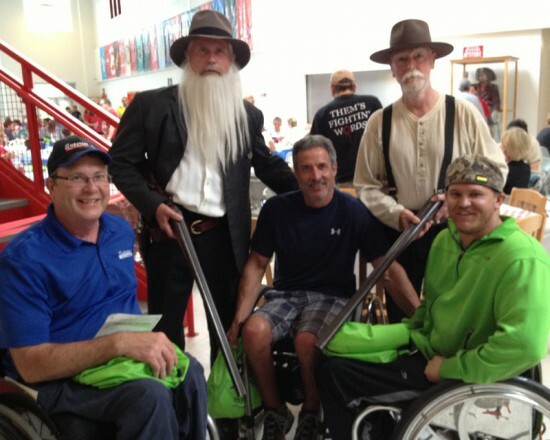 Paul, Grant and Aaron getting their picture taken with Devil Anse Hatfield and Ole Ran’l McCoy. Devil Anse and Ole Ran’l check Aaron and Grant for a stolen hog and then send them on their way.